The coffee bar is the centerpiece in our households. It's what gets us up in the morning, what gathers friends around the table, and get's us through a long day of work. If you're wondering what were stocking our shelves with, its none other than the greatest Counter Culture . 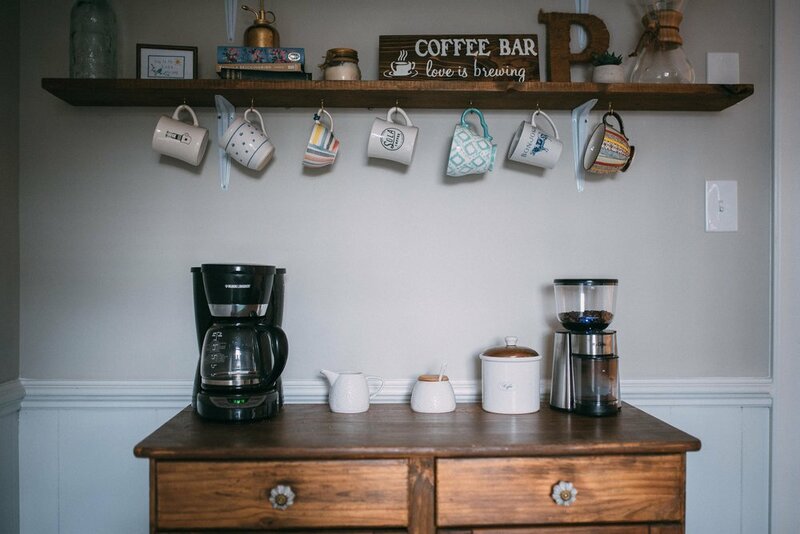 I began with this sweet antique buffet where I keep my coffeepot and grinder, but It lacked the luster and storage capacity for all my other coffee knickknacks. I needed something extra to make the coffee bar feel complete. I absolutely love the open shelf concept. While I prefer floating shelves, we needed something a bit more budget friendly. We grabbed two cedar planks from Lowes (I tried to pick the most knotty, distressed boards) and took them home to beat up. I hammered it, scratched it, burnt the corners, and whipped it with chains, all before staining it with Minwax’s Walnut. If you have never stained anything before, I suggest watching Minwax’s videos. I knew I need to do something about my coffee mug addiction. I try to buy a mug from every new place I visit, so I have an extensive collection. I wanted to display the mugs without taking up too much room on the shelves, so I settled on hooks. We bought a 50 pack of the brass cup hooks and screwed them in about 8 inches apart on one of the boards. We then mounted the boards with the basic 7 inch white brackets for the modern, industrial look, making sure the board with the hooks was the bottom shelf. Once they’re up, the real fun begins. I hung up my mugs from my favorite coffee shops like Chicago’s Ipsento, Boston’s The Thinking Cup, and Raleigh’s Sola along with my souvenir from Ireland, my Anthro tea-cup, and a couple others. Then, I added my coffee bar sign, some cook books, my Chemex, plants and other knickknacks. I tied it together with a dull turquoise color dispersed throughout. Obviously, you can make it your own by what you put on in, but it should be both decorative and functional. We're always looking for new ideas to try, so if you have a quirky and fun way that you decorate your coffee bar, please comment with some pictures! We would love to feature them here.